After the collapse of the western part of the Roman Empire around 400 AD, the Romans continued to rule Greece , but now from their new capital at Constantinople. The Romans weren’t as strong as they had been before, so there were a lot of invasions, especially by the Slavs from the Balkans in the north, and also by pirates from the sea in the south. Greece was much poorer during this time. Also, as people became Christians, the emperors closed the old universities in Athens, because they taught old ideas that were not Christian. Some of the professors there moved east to the Sassanian empire. Greek people rebuilt many of the old temples – including the Parthenon – into Christian churches, and built new Christian churches too. 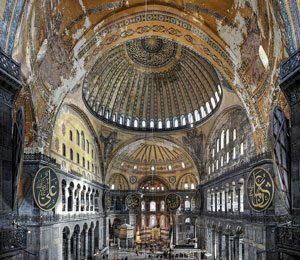 Constantinople continued to rule over Greece until 1453 AD. 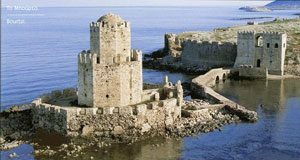 But during the 1100s and 1200s many Norman Crusaders and Venetians took over parts of Greece and built castles there. Then in 1453 the Ottoman Turks succeeded in conquering Constantinople (which they renamed Istanbul) and Greece became part of the Ottoman Empire for the next five centuries. A Short History of Byzantium, by John J. Norwich (reprinted 1998). A little sensationalist, but good information and not too long. Modern Greece: A Short History, by C. M. Woodhouse (5th edition 2000). Starts with the 300s AD. Medieval Greece by Sir Nicolas Cheetham (1981). History of the Byzantine State, by George Ostrogorsky (reprinted 1986). Old, but still the standard full-length account. Cite this page: Carr, K.E. Byzantine Greek history – Greece in the Middle Ages. Quatr.us Study Guides, July 7, 2017. Web. April 19, 2019.